Gatteo Mare Village is a little town that turns into a tourist village, the ideal place for a wonderful vacation! A modern place that offers its guests many fun activities to animate the summer of the whole family! The best hotels (including Belvedere Hotel), bathing facilities, and dozens of shops and restaurants got together to offer their guests an unforgettable stay. Every day, many activities are always new and funny with a group of entertainers that will make nice days on the beach and nights on the streets of Gatteo Mare, unforgettable moments to tell friends and relatives! At Night Animation, Music Band, Latin American dances, “liscio romagnolo”, Cabaret. The Belvedere Hotel is located on the Viale delle Nazioni, the heart of the town of Gatteo Mare. It is full of boutiques, pubs, bars, ice-cream shops and at the evening it becomes a long pedestrian area: a perfect scenery for a relaxing walk. Every Monday from 7.00 a.m. to 1.00 p.m. the town market is taking place in the streets of Gatteo Mare, where you can find foods, clothes, shoes, accessory, linen, etc. Every Tuesday and Friday night, from May to September, from 5:30 p.m. to 12 a.m. at the Giardini Don Guanella, a night market with clothes and accessories. 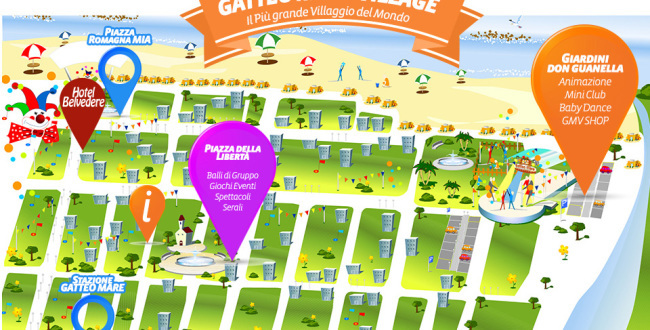 Download the map with all the points of interest in Gatteo Mare: cash machines, pharmacies, churches, market areas, etc. The largest and most famous amusement park in Italy is located about 20 km from the Belvedere Hotel. Discount tickets are available at the hotel. The amusement park with 30 attractions entirely dedicated to children is located in Rimini, about 25 km from the Belvedere Hotel and it is easily reachable by car. Water slides and large pools in the water park in Cesenatico, located 10 minutes from the Belvedere Hotel, for the enjoyment of the whole family. The most famous theme park in Italy, where you will be able to admire perfect scale reproductions of monuments of the major Italian cities, is located about 12 km from the Belvedere Hotel.